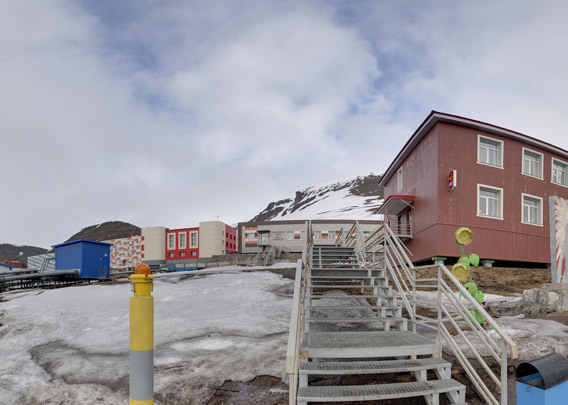 The sunflower next to the stairs is quite famous: it is Spitsbergen’s only one 🙂 a long time ago, the old Pomor Museum used to be in a house behind the stairs, but the museum has moved elsewhere and the house is mostly gone. In the part of the house that is still there, to the right of the stairs, there are the post office and a souvenir shop. The post office is Norwegian, as all of Spitsbergen including Barentsburg are under Norwegian law and sovereignty, according to the Spitsbergen Treaty. Mail sent from the post office in Barentsburg will get a Norwegian stamp and it will be sent via Longyearbyen and mainland Norway. In earlier years, both post office and souvenir shop were in the hotel. During the comprehensive renovation work that started around 2012, they got their own address and more space. The choice of souvenirs is really worth having a look at: there are much more locally made products than for example in Longyearbyen.